Two-phase quartz intergrowths with garnet, cordierite and tourmaline occur commonly in prograde high-temperature migmatites, granulites, as well as in the last crystallization stages of biotite granites. Structural, microtextural and mineralogical data show that they result from the breakdown of biotite in the presence of a melt phase associated with incongruent dissolution of feldspars into the melt and silica release (giving quartz in silica saturated rocks). Biotite breakdown and growth of Al-rich ferromagnesian minerals, occurring at the solid–liquid transition in the crust (early melting or final crystallization), is kinetically controlled by Fe and Mg mass transport, the network-forming cations Si and Al being locally compensated for by feldspar dissolution/crystallization. This process leads to significant changes with respect to equilibrium dehydration-melting reactions wherein quartz is a reactant and K-feldspar a reaction product. Therefore, quartz inclusions commonly occurring in garnets from granulite-facies metapelites and metagraywackes are not simply grains passively included during garnet growth. They may also correspond to newly crystallized phases. Resorption of feldspar may lead to more alkaline melt and to crystalline residue richer in Al than expected under equilibrium conditions. Hence, excess alumina in granulite-facies rocks is not necessarily related to initial alumina-rich whole-rock compositions (as currently considered), but may be due, at least partly, to kinetics of melting. 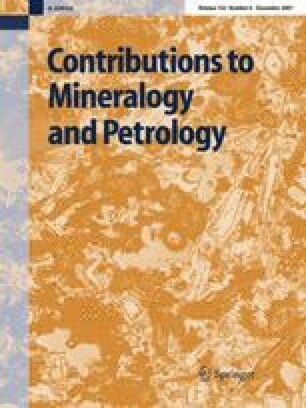 Thanks to M. Pichavant for thoughtful comments on an early version of this manuscript, N. Le Breton for discussion on dehydration melting reactions, and G. Libourel for providing me with samples of Solenzara granulites. Thoughtful comments and suggestions by an anonymous reviewer and J. Touret are gratefully acknowledged. Major element composition of garnet-quartz intergrowth and related matrix from the Reguibat Rise, Mauritania (Aguelt Nebkha area, 25°01′929/7°12′448).